Brighten a Senior’s Day on #LeapofKindnessDay – February 29, Leap Day! 2016 is a #LeapYear. We all get 1 extra day, on Monday, February 29. We are partnering with The Okemo Valley Regional Chamber of Commerce to encourage everyone to use this “extra” day by doing something kind for someone else on #LeapofKindnessDay. 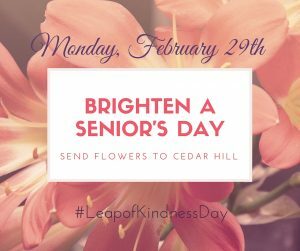 Here at Cedar Hill, we have many residents who would LOVE to receive flowers on #LeapofKindnessDay. The professional staff who cares for these residents also deserve a special thanks for the work they do. If you would like to join us, please contact us for you or your company to setup a donation and delivery of flowers for residents and/or trays of cookies for the professional staff on February 29th. Give us a call at 802-674-6609 to Brighten a Senior’s Day!